Vedette style 317 Full Body Post Partum Compression Body Briefer. This Vedette Full Body Briefer will help sculpt and redefine any woman's natural curves from the Underbust area to just below the knees. Adjustable shoulder straps provide adjustments to every woman's unique fit. The high straight back design is perfect to wear with most strapless dresses and halter tops. One piece design eliminates unsightly waistline bulges while flattening your stomach, back and waist line so you can achieve that classic Hour Glass figure. An additional Strong Compression Latex Thermal Zone in the abdominal area provides extra tummy flattening support. Nylon panels shape and smooth the buttocks without compression to avoid a flattened, shapeless derriere. The open crotch area makes restroom visits convenient and allows for healthy air circulation. Long leggings smooth and shape your Legs, Thighs, Hips to jsut under your knees. This is a body reducer because the Latex makes you sweat and reduce your measurements gradually and at the same time, it works as a body shaper that makes you look great while you wear it. Dual Compression is arrived from combining the comfort and support from the Medium Compression line with strategic placement of Strong Compression Latex in key areas to provide a perfect balance to transform your body. The inner layer is made of a cotton/spandex blend to absorb excess perspiration for your comfort. This garment is extremely helpful when used in conjunction with proper diet and exercise. Braless bodyshaper with removable and adjustable shoulder straps. The high straight back design is perfect to wear with most strapless dresses and halter tops. Latex Thermal Zone in the abdominal area. Helps define waistline that classic Hour Glass figure. Nylon panels shape and smooth the buttocks. Open Crotch area for your convenience. Helps promote weight loose by eliminates toxins through sweat, reduces waist, hips and belly. Therapeutic: Posture support helps benefit the lumbar region by alleviating and avoiding injuries and backaches. Imported : Nylon / Latex / Cotton / Spandex. Available in even sizes 30, 32, 34, 36, 38, 40, 42, 44 in Natural or Black Color. 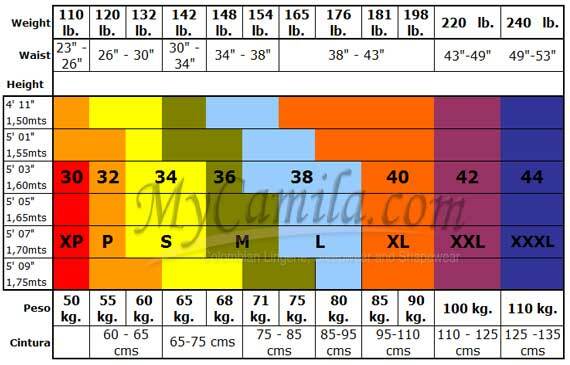 SELECTING YOUR SIZE: You should select your size based on your measurements. Please use the size chart provided below, in case your measurements are close to the limit of two sizes, we suggest selecting the next biggest size. If you need help selecting your size, we will be happy to assist you with proper sizing. Please have your Underbust and waist measurement available when calling or emailing for help and we will be happy to make a suggestion.